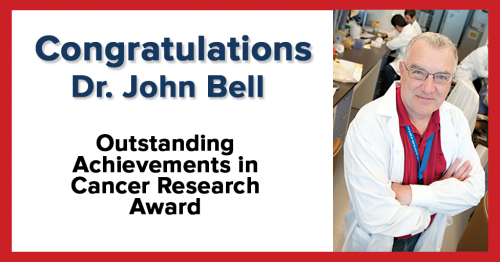 The Canadian Cancer Research Alliance (CCRA) today announced that Dr. John Bell, BioCanRx’s Scientific Director, will receive the award for Outstanding Achievements in Cancer Research for his pioneering work and ground-breaking scientific discoveries, which have propelled the entire field of oncolytic virus therapy forward, and his commitment to enabling translational research. The award is given to a Canadian cancer researcher from any research discipline for outstanding lifetime achievements, which have had an impact in greatly advancing our understanding of cancer, the treatment of cancer, and/or cancer control. Committed to “bench to beside” research, Dr. Bell has worked tirelessly to build the infrastructure to make these state-of-the-art immunotherapies a reality for patients, and through his participation in various community forums, he has made OV therapies understandable to patient populations. The awards will be presented during the CCRA’s Canadian Cancer Research Conference held in Vancouver from November 5-7, 2017. For more information about the conference, see http://conference.ccra-acrc.ca/. Read the full news release including details of the other award recipients.